The most effective way to improve your coordination and well-being is by exercising your brain. Find out how our exercises can help seniors experience the elder years with health and vitality. Our culture expects older people to decline, not move—to be “set in their ways” and not try new things. But research has shown that the brain learns and changes throughout our lives. We have to exercise our brains to keep them growing. This is best done by coordinated movement—activities that combine movement with cognitive skills. Our exercises are designed to stimulate many senses simultaneously. For example while we move we read, or recognize shapes, or recite a poem. You can do Move With Balance exercises almost anytime, anywhere, and as often as you like, as long as you have something sturdy nearby to hold on to if you become unsteady. In the beginning, using a chair or the wall for support will help you work on your balance safely. Participants are encouraged to repeat the exercises until the challenge becomes easier or even automatic. Then you can improve your balance even more if you modify the exercises as you progress. Start by holding on to a sturdy chair for support. To challenge yourself, try holding on to the chair with only one hand; then with time, you can try holding on with only one finger, then no hands. If you are steady on your feet, try doing the exercise with your eyes closed. Constantly repeating the activity and then increasing the challenge is called the progressive challenge. All the Move with Balance movements help you grow new nerve cells and stay flexible, alert, and balanced. These are passionate, playful movements and rich sensory experiences that anchor thought, build mental agility, and encourage life-long learning. 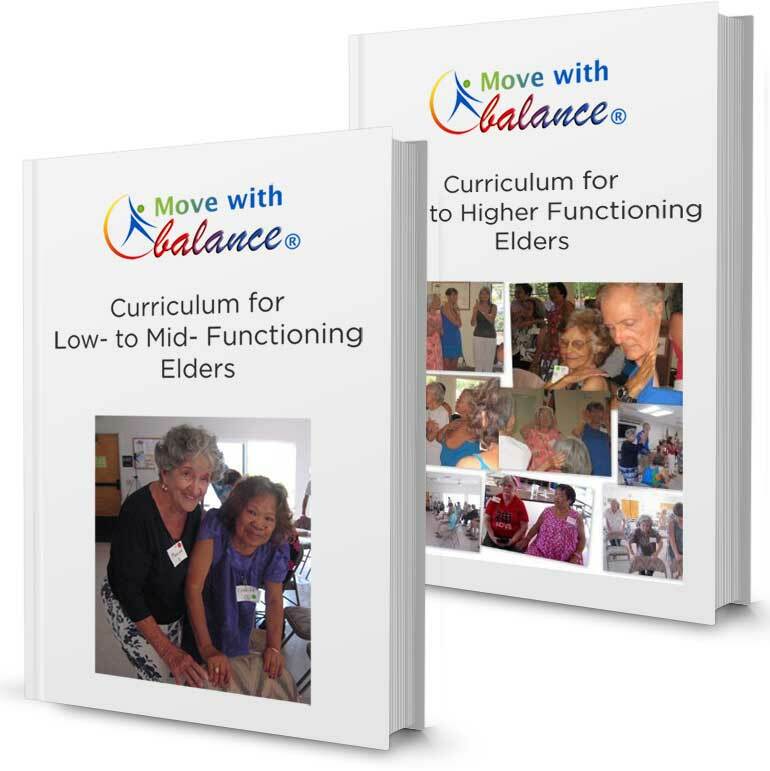 The Move With Balance book, which includes access to over 60 online instructional videos, is the cornerstone of the Move With Balance program. It features easy-to-follow colourful illustrations of dozens of movements and exercises that anyone can do, even the frailest elder. For caregivers and seniors wishing to learn on their own, purchasing the book is the first step towards reducing falls. Move With Balance has an innovative mentor delivery system. 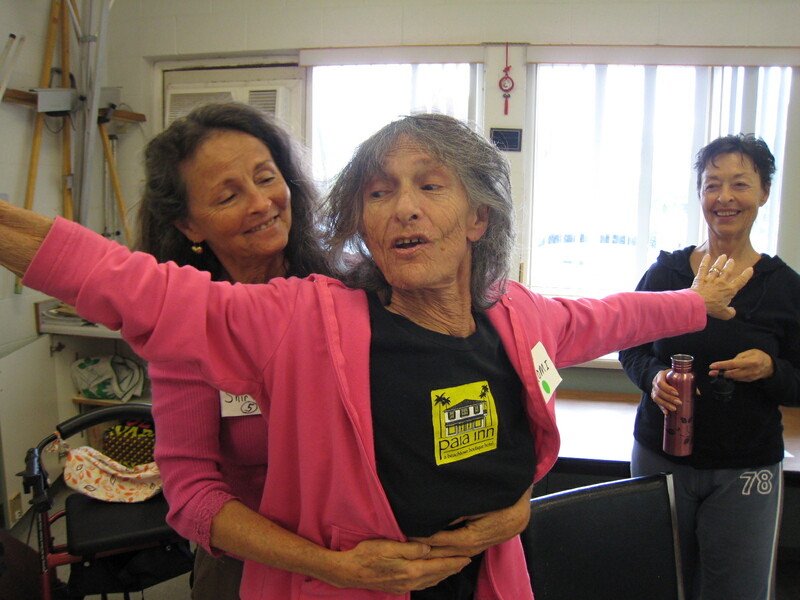 In a group setting, the activities are performed in pairs—fit, volunteer, elder mentor to frail elder. 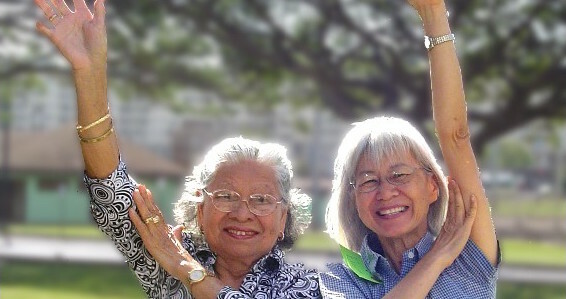 For seniors who are learning on their own, we encourage you to partner with a friend or family member. Many of the exercises in the book can be performed on your own using simple everyday props. However, self-improvement regimens are only effective if they are practiced regularly. Not only does partnering with with a peer encourage participants to maintain the exercise routine, but socialization is also hugely effective in stimulating and maintaining good mental health. Music is a powerful tool for healthy ageing. Strong links between music and motor functions suggest that music represents an interesting aid for motor learning. Music has been shown to enhance the retention of newly acquired verbal information in normal ageing and Alzheimer’s disease (AD). We began using music in our Move With Balance® in 2015. It was so beneficial that we now use music with all the Move With Balance exercises. We have developed a library of music that includes original songs written specifically for our program, as well as new adaptations of some of our favourites classics. Visit the store to purchase individual songs tailored to the exercises in the book. 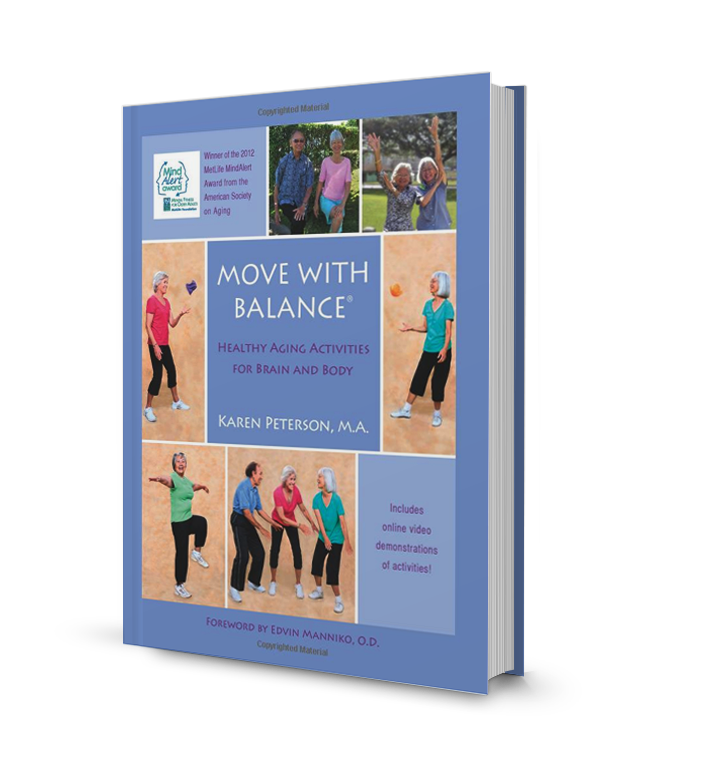 You can also purchase the music manual to learn detailed information on how to combine music with the exercises in the Move With Balance book. Exercise creates the optimal environment for neural plasticity, the ability of the brain to change. Exercise puts the brain and body into balance naturally by regulating brain chemicals that control mood and responses to stress. Our exercises are designed to combine motor and cognitive skills so that you can get the most benefit out of the time you invest. Four independent evaluations and a cost/benefit analysis prove that participants can reduce their medical costs by 20% and reduce falls by 66%. Find out how published independent scientific evaluations prove that participants can reduce their medical costs by 20% and prevent 2 out of 3 falls. The exercises in the book can easily be adapted to suit the individual abilities of every participant. In this way both frail elders and those who are more mobile and independent can reap maximum benefits. Visit the store to download your copies of the customized manuals. or learn more about how the exercises are perfectly suited to patients with Alzheimer’s and/or dementia. Move With Balance is a very adaptable program. 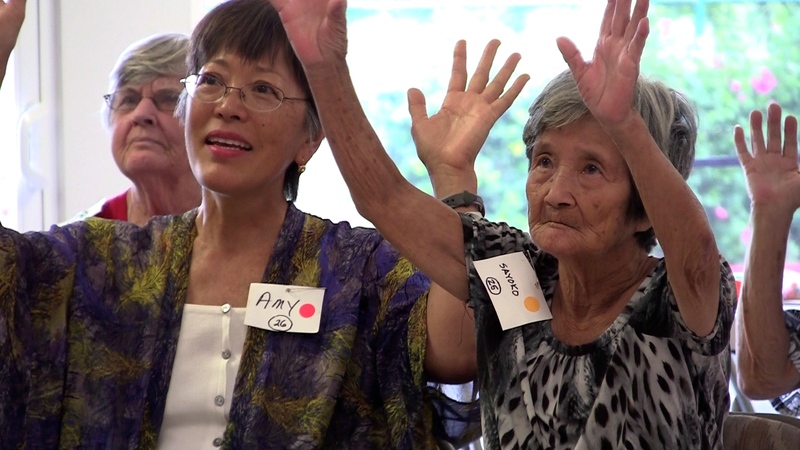 The exercises have been taught to seniors in culturally-diverse Hawaii for over 20 years. 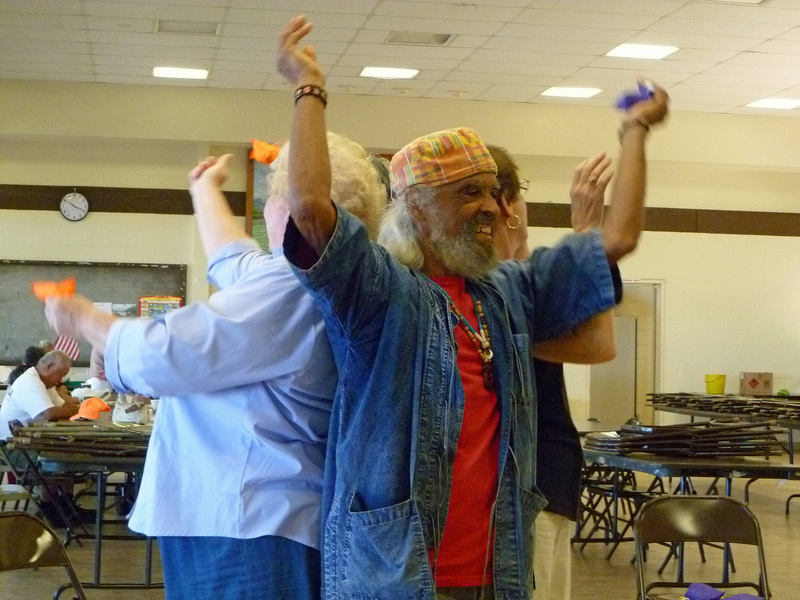 Seniors of all ages, abilities, and cultural background have benefited from the activities. Recently, we ran a pilot project which saw the program being tailored to the cultural needs of the Hispanic community in Denver, Colorado. We trained 10 wonderful Hispanic women who will then go into the Denver community, hold the sessions in their homes, and enjoy the social side of exercising together. Please contact us to discuss how we could tailor the program to the cultural needs of your community.